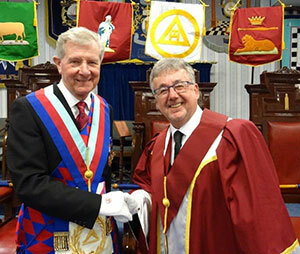 Fylde Chapter No 2758 was hitting all the right notes as Hugh Mett, one of the North Fylde Group’s singers, was installed into the first principal’s chair. Stuart Thornber (left) congratulates Hugh Mett. 72 companions gathered at Cleveleys Masonic Hall to witness a ceremony as well orchestrated as the best concert. The principal guest was the Fylde Coast’s own Stuart Thornber. Joining Stuart were fellow grand officers David Randerson, North Fylde Group Chairman Peter Greathead, Harry Cox, Keith Jackson, David Winder, Malcolm Worsley and Ian Ward, together with Andrew Bartlett, Peter Wahley, Peter Pemberton and Peter Maxwell. 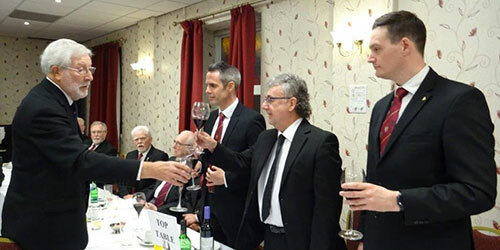 The chapter was opened by the three principals, Glen Jackson, Hugh Mett and David Edwards. Glen Jackson informed the companions of the passing to the ‘Grand Chapter above’ of James Dunn and asked them to show respect to the dearly departed and much-loved companion. The principals then swiftly dealt with the administration of the chapter which included a ballot for three joining members and two candidates for exaltation, showing the chapter is in fine form for the future, John Lee then entered with the three joining members, Geoff Diggles, Pat Deakin and Ken Hoskins who were welcomed to the chapter by Glen and his co-principals. It was then time to receive the principal guest Stuart Thornber, together with the grand and acting Provincial officers. Once the greetings were completed and the guests seated it was time to install the three principals. Glen asked Edwin Fisher to occupy the third principal’s chair and John Chetwynd to occupy the chair of the second principal. Pictured from left to right, are; David Edwards, Stuart Thornber, Hugh Mett and Ryan Modlin with the Patrons certificate. The three principals were in turn presented by John Lee and recited their obligations; Scripture readings were given by Geoff Diggles (first principal) Jack Baxter (second principal) and Creag Williams (third principal). They were then installed in succession by their predecessors in an impressive and heartfelt ceremony, Hugh Mett as first principal, David Edwards as second principal and Ryan Modlin as third principal. Once the inner workings were complete the companions who had not been through the principals’ positions were re-admitted and introduced to the newly installed principals. The robe addresses were given with passion, starting with Jack Baxter who delivered the scarlet robe address, Jon Moss the purple robe address and lastly by Alan Fairhurst who delivered the blue robe address. John Cross quickly followed by delivering the address to the three principals in an unfaltering manner, leaving the final address, that the companions of the chapter, in the hands of the principal guest Stuart Thornber. 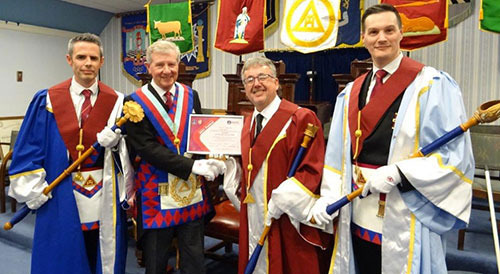 On the completion of the ceremony Stuart rose to convey the greetings of the Grand Superintendent Tony Harrison and was presented with a cheque for £850 for the 2021 Masonic Charitable Foundation and in return Stuart was pleased to present Hugh with a Patron’s certificate. At the festive board, Stuart congratulated the three principals and wished them well for the year ahead. He also congratulated Glen for all his hard work over the past year and that as almoner for the chapter. Stuart spoke passionately about the 2021 Festival saying that as there are two years left to run that as in previous festivals it was the jewel that raised a substantial amount of money and asked the companions to support the Festival by taking patronage of the steward’s jewel. Finally, Stuart thanked the very hardworking director of ceremonies John Lee whose leadership was like any good conductor in keeping the orchestra working together and in tune. This time the tables were turned on Hugh Mett who so many times before had sung the song to the three principals, was this time on the receiving end. The song was rendered by John Chesters accompanied by Malcolm Worsley. The newly admitted companion Pat Deakin conducted a ‘West Houghton’ raffle which raised £340 which will go to the MCF 2021 festival. The evening was suitably brought to a close by the janitor’s toast.